In cooperation with the HfbK University of Fine Arts Hamburg. Funded by the Department of Culture Hamburg and the Hans-Böckler Foundation. 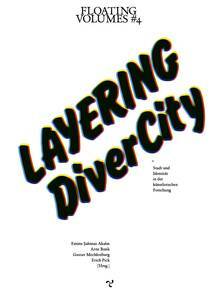 Floating Volumes # 4 - Layering DiverCity is the continuation of an exhibition and event series initiated in 2010, which deals with the topic of city and identity by various artistic and cultural scientific positions. Cities are complex, procedural and substantive structures of signs and codes, stories, and memories, productions, and intensities. Private and collective structures of urban space are organized by economic and political decisions. Space is produced by subjects and at the same time it constitutes subjects. With the conference and exhibition we want to mix up and stimulate the dialog between cultural scientific and artistic approaches. In recent years, the interplay between urbanism and identity has inspired art theory and cultural science mainly academically. But a conference organized by artists - from the point of artistic production - is a new approach. Due to artistic research approaches and artistic-scientific positions, which have been established in recent years, this revision has been made possible . Within this shift a variety of transfer processes between artistic methods and scientific approaches are taking place, raising questions of the conditions and possibilities of translations. Our aim is to reflect critically on different types of current developments in various cities, the methods of artistic research and processes of participation in urbanenvironment. Generally, we are in charge of topics concerning repetitions and their displacements, negotiating options and their appropriations, which all can be imported and materialized through art and culture. There were four panels for lectures and presentations and one exhibition, which are enable to mediate the dialog between the invited positions. In addition, the conference serves as an exchange platform for different experiences of different actors in the various cities, such as Cairo, Istanbul, Hamburg, Berlin. It is supposed to enhance an international network. City and Identity within Artistic Research. The exhibitions were curated by the artist-curators Emine Sahinaz Akalin and Erich Pick. The project exists since 2010. The next exhibition will be in November 2013. 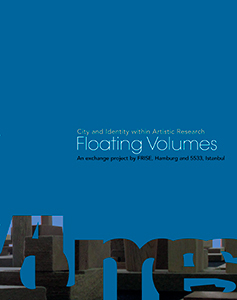 The project, Floating Volumes, dealt with the topics of city and identity within artistic research an examined the cities of Hamburg and Istanbul. Within this project, city was defined as a social space built from narratives and visions. Those standing to gain from the political, economic, and cultural visions determine the way of reading the urban space. Media presentations such as that seen in the daily press or blogs, travel guides or Google Panoramio and television spread specific stories about streets, squares, neighborhoods and organizations. Therefore, only specific histories and specific (re)presentations of spaces are produced. Empty and deserted lots and lower income areas become places for reflections on new visions, utopias and dystopias. The people who make these reflections and tell these stories not only re-generate given versions of narratives, but also subjectively rewrite interpretations. Our aim is to show how designs for these projects and these types of stories are generated and how subjective differences can be engrafted. While doing this, we want to investigate and point out representative examples and ascription of identity. Authors and artists: Michaela Ott, Christa Müller, Carla Orthen, Anke Haarmann, Michael Ziehl, Birgit Schlieps, Iz Öztat, Jan Köchermann, Eva Leitolf, Per Schumann, Malte Zacharias, Peter Boué, Sari Palosaari, Jens Röhm, Kathrin Wildner, Anna-Lena Wenzel, Eray Çayli, Silvina Der-Meguerditchian, Hanne Loreck, Nina Möntmann. Floating Volumes #1/#2. City and Identity within Artistic Research. An exchange project by FRISE, Hamburg and 5533, Istanbul including 21 artists.